Learn how to start and make the most of book clubs for comics and graphic novels with the Comic Book Club Handbook, a new resource produced by Comic Book Legal Defense Fund in collaboration with Comic-Con International! Designed for librarians, retailers, and individuals alike, the Comic Book Club Handbook goes inside the how’s and why’s of creating a graphic novel book club. The handbook provides proven strategies for getting started, selecting books, engaging your community, managing discussions, and much more, including a helpful table of books to get you started! This publication is the latest in the ongoing education collaboration between Comic Book Legal Defense Fund and Comic-Con International, who co-produced the handbook with the assistance of Erwin Magbanua of the San Diego Public Library. The Comic Book Club Handbook is illustrated throughout by legendary cartoonist Rick Geary! Download a PDF of the Comic Book Club Handbook here. 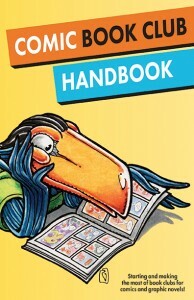 Hard copies of the Comic Book Club Handbook are available in the CBLDF Rewards Zone here.